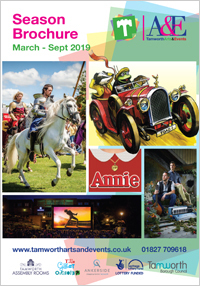 Tamworth Borough Council’s Arts in Unusual Spaces project has been put forward for an honour in the 2019 What’s On Readers’ Awards after being nominated by readers of the arts and entertainment guide – and your votes are now needed to help it secure a place in the final round. The project has been listed as ‘Tamworth Arts Festival’ in the Best Staffordshire Arts Festival category and needs enough online votes to make it to the shortlist of five which will be announced next month. 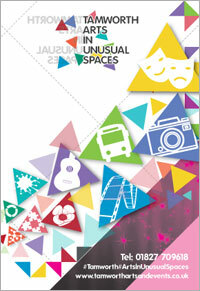 The two-year Arts in Unusual Spaces project was developed and delivered by the council’s Arts and Events team after successfully bidding for £68,000 from Arts Council England, with match funding provided by Tamworth Borough Council and community partners. Although the project has now come to an end, it has left a lasting legacy in the form of new partnerships with artists and members of the community, a variety of community artwork which can be seen around the town and a new audience of people who have discovered an interest in the arts and creativity. Arts in Unusual Spaces had a number of strands designed to bring art to unusual spaces, with the aim of creating a sustainable future for the arts in Tamworth, building relationships within the community, working with high profile arts organisations and providing new opportunities for people to get creative. This included some ambitious projects for the town such as We Will Remember – a major Remembrance event to mark 100 years since the end of WWI including a cascade of more than 4,000 plastic poppies made by Tamworth people from the top of the Castle, Mercian Mosaic – which brought together 1,400 individually-designed yard-square tiles on the lower lawn of the Castle Grounds to create one striking image (each tile was created by Tamworth people, schools and community groups), and the creation of a new sculpture of Tamworth’s Lady of the Mercians, Aetheflaed, which now stands pride of place outside Tamworth Railway Station to welcome visitors to the town. Arts in Unusual Spaces also saw the creation of a new ‘Catch Art’ trail of eye-catching bus shelters throughout the town which have been designed by different community groups and schools. This strand has inspired other groups to source their own funding to make-over additional shelters in the area. Other lasting legacies include the development of a new film showcasing ‘24 Hours in Tamworth’ which enabled budding photographers and videographers to learn new skills, Touring Theatre, which helped community venues such as churches and community centres host professional theatre and entertainment events, Music Outside which helped develop up-and-coming local musicians and Art Attack which brought a variety of family-friendly art activities to the town centre on a huge day of creativity. The project has also led to the creation of a new Creative Network in Tamworth, which is an online portal of artists, venues, hirers, suppliers, education providers and creatives in Tamworth. During the 26 months it was running, more than 16,000 people got involved with Arts in Unusual Spaces, as well as almost 200 partners, 23 local venues and resulting in almost 500 employment days for local artists. It won a number of international, national and local awards, saw almost 50 education, training and participation workshops taking place and raised the profile of Tamworth across the region, including on the BBC and ITV. A total 100% of audience respondents enjoyed the events and their experiences and 99% said they had been inspired to attend future events in Tamworth. More than half (54%) had never attended an arts event in Tamworth before. Cllr John Chesworth, Tamworth Borough Council’s Cabinet member for Culture and Operational Services, said: “Arts in Unusual Spaces has been such an amazing project resulting in some brilliant events that really brought the community of Tamworth together. Initiatives like the Mercian Mosaic, We Will Remember and the Aethelfest celebrations to mark 1100 years since the death of Aethelflaed will certainly not be forgotten for a long time. And of course this project has given us a wonderful new statue that will be enjoyed for generations to come. “The aim of Arts in Unusual Spaces was to attract new audiences, encourage more people to get creative and take art in all its forms out into corners of the community to people who might never have been to the theatre or taken part in a community art project before. “Some amazing things have been achieved and I think the real triumph is the legacy this project has left in terms of new audiences, new partnerships and new networks that will continue long into the future. Congratulations to all involved in making this happen, from the team at the council to the artists, volunteers and participants who showed just how creative Tamworth can be. Votes can be cast via https://www.whatsonlive.co.uk/Readers-Awards-2019. You can go straight to the Staffordshire section at number 20, where Tamworth Castle and the St George’s Day Festival are also nominated. Tamworth Arts Festival is listed at number 24.